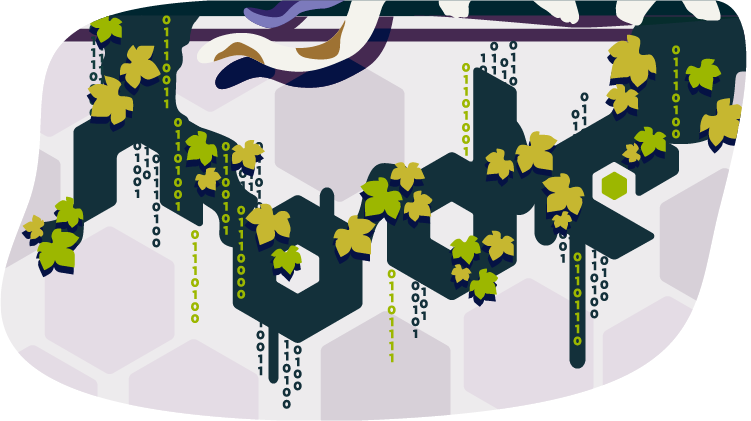 As great as Node.js is for “traditional” web applications, its potential uses are far broader. Microservices, REST APIs, tooling, working with the Internet of Things and even desktop applications: it’s got your back. Another area where Node.js is really useful is for building command-line applications — and that’s what we’re going to be doing in this article. We’re going to start by looking at a number of third-party packages designed to help work with the command line, then build a real-world example from scratch. What we’re going to build is a tool for initializing a Git repository. Sure, it’ll run git init under the hood, but it’ll do more than just that. It will also create a remote repository on GitHub right from the command line, allow the user to interactively create a .gitignore file, and finally perform an initial commit and push. As ever, the code accompanying this tutorial can be found on our GitHub repo. Tip: that isn’t necessarily true, in that your command-line tool may have other external dependencies. 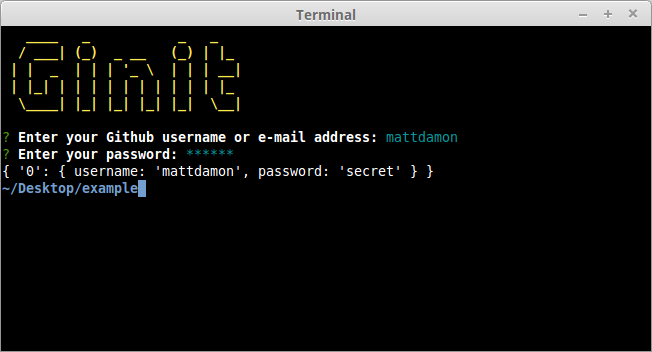 For this tutorial, We’re going to create a command-line utility which I’m calling ginit. It’s git init, but on steroids. You’re probably wondering what on earth that means. push up to the remote repository. There are often more steps involved, but we’ll stick to those for the purposes of our app. Nevertheless, these steps are pretty repetitive. Wouldn’t it be better if we could do all this from the command line, with no copy-pasting of Git URLs and such like? So what ginit will do is create a Git repository in the current folder, create a remote repository — we’ll be using GitHub for this — and then add it as a remote. Then it will provide a simple interactive “wizard” for creating a .gitignore file, add the contents of the folder and push it up to the remote repository. It might not save you hours, but it’ll remove some of the initial friction when starting a new project. One thing is for certain: in terms of appearance, the console will never have the sophistication of a graphical user interface. Nevertheless, that doesn’t mean it has to be plain, ugly, monochrome text. You might be surprised by just how much you can do visually, while at the same time keeping it functional. We’ll be looking at a couple of libraries for enhancing the display: chalk for colorizing the output and clui to add some additional visual components. Just for fun, we’ll use figlet to create a fancy ASCII-based banner and we’ll also use clear to clear the console. In terms of input and output, the low-level Readline Node.js module could be used to prompt the user and request input, and in simple cases is more than adequate. But we’re going to take advantage of a third-party package which adds a greater degree of sophistication — Inquirer. As well as providing a mechanism for asking questions, it also implements simple input controls: think radio buttons and checkboxes, but in the console. We’ll also be using minimist to parse command-line arguments. configstore — easily loads and saves config without you having to think about where and how. touch — a tool for implementating the Unix touch command. Although we’re going to create the application from scratch, don’t forget that you can also grab a copy of the code from the repository which accompanies this article. repo.js — Git repository management. check whether a directory exists (to determine whether the current folder is already a Git repository by looking for a folder named .git). This sounds straightforward, but there are a couple of gotchas to take into consideration. Secondly, the preferred method of checking whether a file or directory exists keeps changing.The current way is to use fs.stat or fs.statSync. These throw an error if there’s no file, so we need to use a try … catch block. Finally, it’s worth noting that when you’re writing a command-line application, using the synchronous version of these sorts of methods is just fine. With this in place, we can start developing the application. Now let’s implement the start-up phase of our console application. The output from this is shown below. Tip: notice we’re using the chalk module to show a red-colored message. The next thing we need to do is create a function that will prompt the user for their GitHub credentials. We can use Inquirer for this. The module includes a number of methods for various types of prompts, which are roughly analogous to HTML form controls. In order to collect the user’s GitHub username and password, we’re going to use the input and password types respectively. As you can see, inquirer.prompt() asks the user a series of questions, provided in the form of an array as the first argument. Each question is made up of an object which defines the name of the field, the type (we’re just using input and password respectively here, but later we’ll look at a more advanced example), and the prompt (message) to display. The input the user provides will be passed in to the calling function as a promise. If successful, we’ll end up with a simple object with two properties; username and password. Then run the script using node index.js. The next step is to create a function to retrieve an OAuth token for the GitHub API. Essentially, we’re going to “exchange” the username and password for a token. Of course, we don’t want users to have to enter their credentials every time they use the tool. Instead, we’ll store the OAuth token for subsequent requests. This is where the configstore package comes in. It determines the most appropriate location for the file for you, taking into account your operating system and the current user. There’s no need to explicitly read or write to the file. You simply modify a configstore object and that’s taken care of for you in the background. If the configstore file doesn’t exist, it’ll return an empty object and create the file in the background. If there’s already a configstore file, the contents will be decoded into JSON and made available to your application. You can now use conf as a simple object, getting or setting properties as required. As mentioned above, you don’t need to worry about saving it afterwards. That gets taken care of for you. If a conf object exists and it has github.token property, this means that there’s already a token in storage. In this case, we return the token value back to the invoking function. We’ll get to that later on. If no token is detected, we need to fetch one. Of course, getting an OAuth token involves a network request, which means a short wait for the user. This gives us an opportunity to look at the clui package which provides some enhancements for console-based applications, among them an animated spinner. Tip: you can also set the caption dynamically using the update method. This could be useful if you have some indication of progress, for example displaying the percentage complete. if we manage to get an access token, we set it in the configstore for next time. we then return the token. Any access tokens you create, whether manually or via the API as we’re doing here, you’ll be able to see them here. During the course of development, you may find you need to delete ginit’s access token — identifiable by the note parameter supplied above — so that you can re-generate it. Tip: if you have two-factor authentication enabled on your GitHub account, the process is slightly more complicated. You’ll need to request the confirmation code — for example, one sent via SMS — then supply it using the X-GitHub-OTP header. See the documentation for further information. Please note you may get a Promise error if something goes wrong, such as inputting the wrong password. I’ll show you the proper way of handling such errors later. Once we’ve got an OAuth token, we can use it to create a remote repository with GitHub. Again, we can use Inquirer to ask a series of questions. We need a name for the repo, we’ll ask for an optional description, and we also need to know whether it should be public or private. 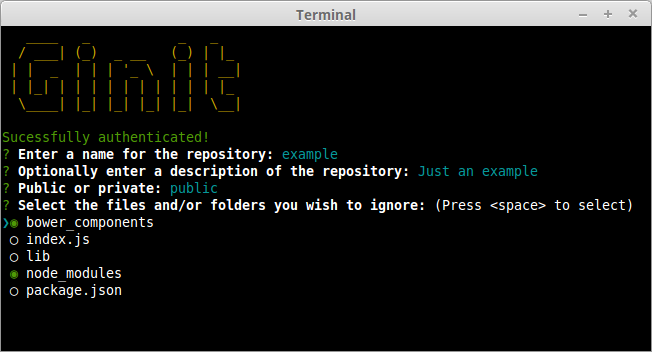 ginit my-repo "just a test repository"
This will set the default name to my-repo and the description to just a test repository. Tip: this only really scratches the surface of the minimist package. You can also use it to intepret flags, switches and name/value pairs. Check out the documentation for more information. Once we have that information, we can simply use the GitHub package to create a repo, which will give us a URL for the newly created repository. We can then set that up as a remote in our local Git repository. First, however, let’s interactively create a .gitignore file. For the next step, we’ll create a simple command-line “wizard” to generate a .gitignore file. If the user is running our application in an existing project directory, let’s show them a list of files and directories already in the current working directory, and allow them to select which ones to ignore. The Inquirer package provides a checkbox input type for just that. Notice that we can also provide a list of defaults. In this case, we’re pre-selecting node_modules and bower_components, should they exist. Once “submitted”, we then generate a .gitignore by joining up the selected list of files, separated with a newline. Our function now pretty much guarantees we’ve got a .gitignore file, so we can proceed with initializing a Git repository. There are a number of ways to interact with Git, but perhaps the simplest is to use the simple-git package. This provides a set of chainable methods which, behind the scenes, run the Git executable. push the working directory up to the remote. As you can see, we ensure the user is authenticated before calling all of our other functions (createRemoteRepo(), createGitignore(), setupRepo()) sequentially. The code also handles any errors and offers the user appropriate feedback. You can check out the completed index.js file on our GitHub repo. Next, we need to add a bin property to our package.json file. This maps the command name (ginit) to the name of the file to be executed (relative to package.json). Tip: this will also work on Windows, as npm will helpfully install a cmd wrapper alongside your script. 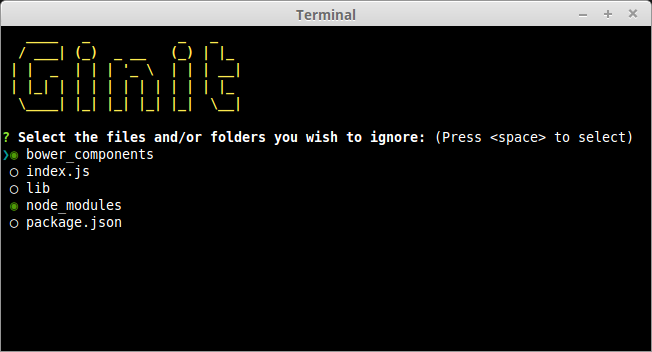 We’ve got a fairly nifty, albeit simple command-line app for initializing Git repositories. But there’s plenty more you could do to enhance it further. If you’re a Bitbucket user, you could adapt the program to use the Bitbucket API to create a repository. There’s a Node.js API wrapper available to help you get started. You may wish to add an additional command-line option or prompt to ask the user whether they want to use GitHub or Bitbucket (Inquirer would be perfect for just that) or merely replace the GitHub-specific code with a Bitbucket alternative. You could also provide the facility to specify your own set of defaults for the .gitgnore file, instead of a hardcoded list. The preferences package might be suitable here, or you could provide a set of “templates” — perhaps prompting the user for the type of project. You might also want to look at integrating it with the .gitignore.io command-line tool/API. Beyond all that, you may also want to add additional validation, provide the ability to skip certain sections, and more. If you have any other ideas, do let us know in the comments. This article was peer reviewed by Dan Prince. Thanks to all of SitePoint’s peer reviewers for making SitePoint content the best it can be!